What Is a Normal Resting Heart Rate for Children? Resting heart rate, also called pulse rate, is the number of times the heart beats in one minute while a person is at complete rest. Pulse rates that are erratic, weak, high or low can indicate health problems. In several locations, blood vessels run close enough to the skin's surface that the heart rate can be detected. The resting heart rate is easy to obtain on yourself or your child. Children have higher heart rates than adults. Heart rate tends to decrease across childhood up to adolescence. Age norms for resting heart rate are available at We Be Fit. There is significant variability in children's heart rates even within age groups. Newborns have heart rates that range from 100 to 160 beats per minute (bpm). Children from ages 1 to 10 have heart rates than range from 60 to 140, and average from 85 to 90. Children who are 11 to 17 have heart rates that range from 60 to 100 bpm. Just as with adults, female children tend to have slightly higher resting higher heart rates than males. It is relatively easy to measure resting heart rate. The measurement should be obtained in the morning immediately after awaking and before getting out of bed. Note that several factors can affect heart rate, including deep breathing, pressure on the bladder, and emotional arousal such as could be caused by anticipating events of the day or by having a parent at the bedside obtaining a heart rate measurement. To obtain a more reliable measure of resting heart rate, measure the heart rate on five consecutive days, sum the five scores, then divide by 5 to yield a 5-day average resting heart rate. You can find the pulse in the radial artery of the wrist. With the child's hand facing up, place your index and middle fingers on the child's wrist, below the base of the thumb. Do not use your thumb as you may feel your own pulse from your thumb. Use a stop watch or a clock with a second hand to track the time. Count the number of pulse beats you feel over 30 seconds, and then double this number to get the full heart rate. If the pulse feels erratic, or if you feel that you may have missed a beat or two, measure the heart rate for a full minute. It may be difficult to feel a radial pulse in infants and overweight children. The pulse can also be felt on the inside of the upper arm, over the brachial artery. 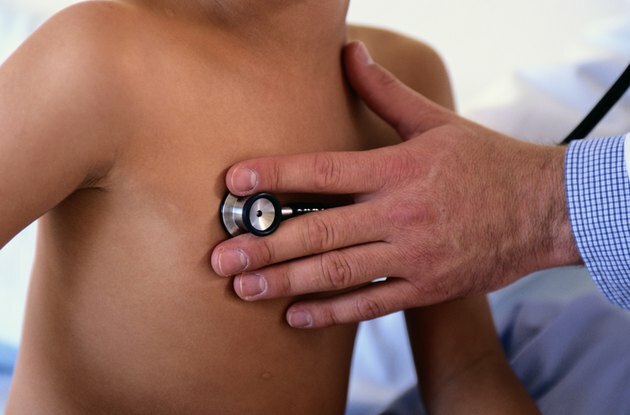 A child's pulse can also be counted while listening to the heart beat with a stethoscope. You may have problems with measuring pulse rate if you have decreased sensation in your fingers or if you do not use the correct pressure. If you apply too little pressure, you may miss some beats. Too much pressure can slow the heart rate. Extraneous movement, for example, of the feet or the other hand, can increase the heart rate. Some medications, such as decongestants or asthma medication, can increase heart rate. If your child reports problems associated with an elevated or depressed heart rate, or if the resting heart rate is higher or lower than normal or is erratic or weak, calling your child's doctor for an evaluation. For example, call the doctor if your child has symptoms such as an irregular or rapid heartbeat, chest pain, fainting, dizziness, shortness of breath or light-headedness. What Is the Normal Resting Heart Rate in Toddlers?